Tsunami waves caused by the huge quake off Japan have reached the US Pacific coast, hours after bowling past Hawaii, but it was largely spared major damage. 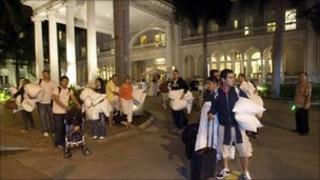 Thousands of people had been ordered to leave coastal areas in the US state of Hawaii ahead of the waves' arrival. Evacuation orders were also issued in some coastal areas of the western US and Canada's British Columbia province. At least five people in California and Oregon were swept out to sea, and some boats were torn from moorings. Waves of over 6ft (2m) struck Crescent City in California, damaging vessels and harbour docks, while Santa Cruz sustained about $2m (£1.25m) in damage, emergency officials said. The tsunami warning has now been downgraded to an advisory in Hawaii but officials urged people still to stay away from beaches. The West Coast and Alaska Tsunami Warning Center has also downgraded its warning to an advisory, California Emergency Management Agency spokesman Jordan Scott said. "Things seem to be settling down at the moment," he said. Earlier, US President Barack Obama said he was monitoring the threat to Hawaii, his home state, and the US West Coast. Speaking at the White House on Friday, he urged Americans to heed orders to leave their homes if they were given. "Let me just stress that if people are told to evacuate, do as you are told," he said. "Today's events remind us of just how fragile life can be." About 30,000 residents live in Hawaii's coastal inundation zones. The first wave of the tsunami passed through Midway Island - a small atoll at the north-western end of the Hawaiian archipelago, about 500 miles (800km) from Hawaii's main islands - at about 1125 GMT, bringing a wave of more than 8ft (2.4m), the local Star Advertiser newspaper reported. But waves were measured at 1.6ft at Nawiliwili on the island of Kauai and 2.3ft on Barbers Point on Oahu, local officials said. Earlier reports suggested waves of up to 6ft might hit Hawaii's main islands. The main airports on Maui, Kauai and the Big Island of Hawaii were shut down, and the US Navy ordered all warships in Pearl Harbor to remain in port in case they are needed for rescue missions. Waves generated by the tsunami reached the west coast of the US at 0830 local time (1630 GMT) but had significantly diminished in strength. Several beach towns in Oregon were on high alert, and four people were rescued from the water in the coastal state. One man who had been taking photos of the waves in northern California was still missing on Friday afternoon. Some surfers on the West Coast were determined to make the most of the conditions. "The tides are right, the swell is good, the weather is good, the tsunami is there. We're going out," surfer William Hill, an off-duty California state trooper, told the Associated Press. No damage has been reported from a 5ft wave that hit Alaska's coast. In the US Pacific island territory of Guam, two US Navy submarines were pulled free of their moorings by powerful waves but were recovered by tug boats. The tsunami was triggered by a massive earthquake which hit the north-east of Japan, at 1446 local time (0546 GMT). Seismologists say it is the most powerful earthquake to hit Japan since records began. A tsunami warning was extended across the Pacific to North and South America.